No cheering, no cameras and some would say no fun. Inside the debate hall at Washington University in St Louis, the crowd was told to "simply be silent" during the hour and a half. "Be respectful of what is going on down here," moderator Charles Gibson charged the audience. But across campus, in Graham Chapel, students, faculty and staff of Washington University were under no such admonishments. At the two-minute warning before the debate, the students started clapping in unison, waiting to cheer for their man. "John Kerry, John Kerry, John Kerry," the chant went up. It was a clearly partisan audience. When George W Bush took the stage, there were some boos amidst the cheers, and thunderous applause greeted John Kerry when he was announced. This was not a sitcom, but the students provided a running laugh track behind Mr Bush, jeering at his folksy witticisms on lines that normally gain thunderous applause at his rallies. When Mr Bush said there were "rumours on the internets" about a reinstitution of the military draft, the students roared with laughter, internet being single not plural, as this wired generation knows. But Mr Bush did have his fans. When he said, "You've gotta be consistent", his supporters cheered. And the president's sharpened attack lines about Mr Kerry's flip-flopping gained enthusiastic applause from the small group of conservatives. The students wore their politics on their sleeves, their trousers and just about anywhere they could plaster or pin a political message. Many students wore pink shirts saying, "John Kerry give George Bush the pink slip" - American shorthand for a job termination notice. 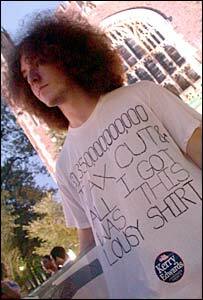 Daniel Epstein of Evanston, Illinois, wore a home-made shirt that said, "$1.35 trillion in tax cuts, and all I got was this lousy shirt." "[The Bush administration] had this enormous tax cut, and the middle class saw very little of it," he said. He supports John Kerry because he believes the Bush administration has not been open and transparent. To be successful "he needs to copy what he did last time as much as possible", Mr Epstein said, adding that he got quite a bounce in the polls after his first debate performance last week. Nadia Graves of Lakeview, Michigan wore a Bush-Cheney t-shirt. "It would be bad to change presidents in the middle of the war," she said. "President Bush will do the right things, keep us safe. I don't know what John Kerry will do," she said. She conceded that John Kerry gained a little momentum with his performance in the first debate, and she said the president needed to speak clearly. Jonathan Wolfson held a "W '04" sign. The war on terror is the most important issue for him. "While weapons of mass destruction have not been found, Kerry has even said, it does make America safer that Saddam Hussein is not in power anymore," he said. He believes that Mr Bush's policies have worked. And he said the president had an advantage going into this debate. "He really does connect better with people than John Kerry," he said. Trust is more important than intellect or eloquence for American voters, he said, and he thought that Mr Bush's plain-spoken, folksy style has won the trust of most voters. Afterwards, Mr Wolfson said his friends who support Mr Kerry were disappointed because their man was unable to deliver a knockout blow. 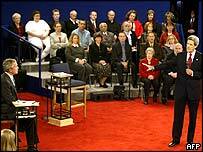 Mr Bush put behind him the weaknesses of his first debate performance, he thought. "This was head and shoulders above the first debate," he added. 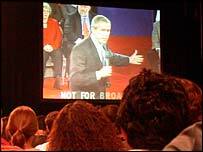 He said Mr Bush used the town hall format effectively, using it to reach out to voters. Voters feel that the president is speaking to them directly instead of speaking to a crowd or to the camera, he said. And some Kerry supporters were indeed slightly disappointed that their candidate wasn't able to "seal the deal". "I think Kerry should have answered some of the questions more directly," especially questions on foreign policy, said Josh Mosberg, who watched the debate with a group of Kerry-Edwards supporters. But Ben Jackson from Long Island, New York, said some undecided voters are more concerned about domestic issues like health care and the economy than foreign policy. "I think that Kerry increased his lead with those voters," he said. However, Josh, Ben and Daniel Epstein all said that Mr Kerry built on his momentum from the first debate. But Daniel added: "I think this debate was a little closer because George Bush wasn't as pitiful."